We had a wonderful half term with some stunning work produced but even before we had started the New term, enquiries have been coming in and now we are fully booked. HALF TERM NOW FULLY BOOKED ! Incredibly we are now fully booked for this half term. We will be running holiday classes throughout the Easter Holidays. This years dates are Tuesday 9th to Thursday 18th April 2 019. Do get in contact if you are interested. Many apologies if you didn’t get a place this time, with small classes we book up quickly. FEBRUARY HALF TERM. OPEN FOR BOOKING ! First week into our regular classes and we are already looking towards February Half Term ! £40 per child per day. Personalised tuition, lots of choices in starting points, materials and techniques. High ratio of tutors to students and a genuinely supportive atmosphere. Studio venue : St Mary and St John Primary School, end of Bedford Street, Oxford, OX4 1SU. If interested please use the contact form to ask questions or to book. We look forward to hearing from you ! OCTOBER HALF TERM FULLY BOOKED ! Hi, I’m sorry we are now fully booked for the October Half term (22nd -26th October) Our next block of classes are next year during the February Half term (18th - 22nd February). Booking opens from 1st January 2019. I hope to see you then ! After huge interest in the Summer classes we are now fully booked. Our apologies to all those we are unable to accommodate this time. Our next block of holiday classes will be 22nd to 26th October 2018. Looking forward to getting started now ! As parents are already booking places I thought we should let everyone know that we are running classes this Summer from 10am to 3pm (Monday to Friday) from 26th July to 22nd August for 7yrs to 16yrs. As always you can pick and chose your days and I would recommend spreading out the dates if you are thinking of a younger child as the day can be quite tiring and we wouldn't want to put anyone off ! The days are tailored to suit the individual with a choice of materials and exciting starting points, so something to suit everyone. The student to tutor ratio is extremely good, with experienced tutors on hand to inspire, demonstrate materials and help students formulate their own unique project. The fee per day is £40, please use the contact form for more information and or book. Congratulations to our students ! Congratulations to our GCSE and A level students for their outstanding results ! WE ARE NOW TAKING BOOKINGS FOR THE SUMMER ! WHAT A BUSY SCHOOL YEAR IT'S BEEN !? NOT QUITE DONE YET, BUT SUMMER CLASSES ARE BEGINNING TO FILL UP ! 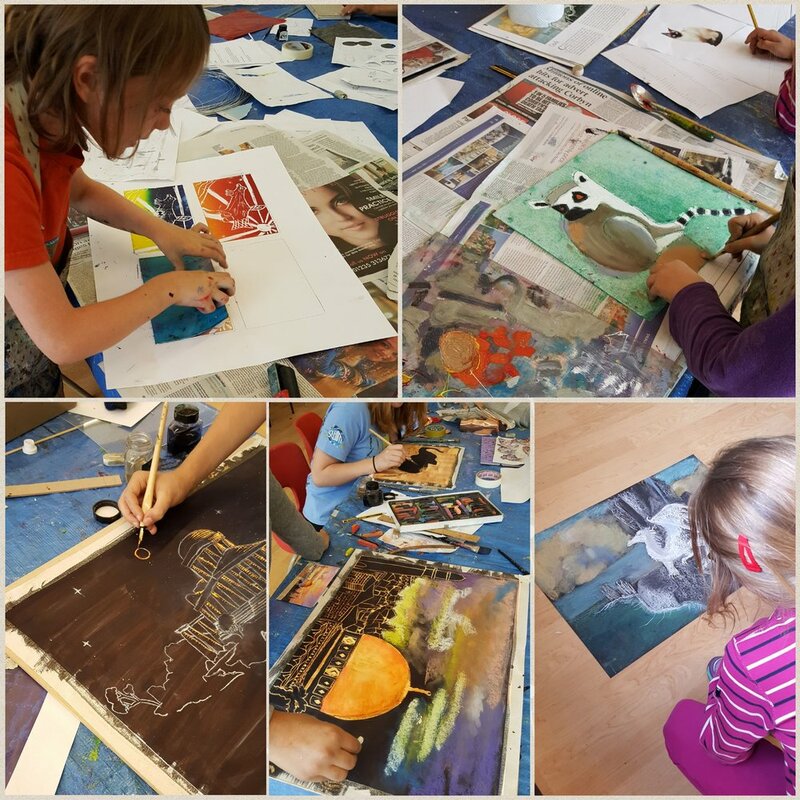 We will be running our popular creative Art classes for 4 weeks this Summer and are taking bookings now. HALF TERM CLASSES ALREADY ?? Just a quick reminder that we will be running classes during this coming holiday. I know ! The time just flies by !! £36 per day for 2-4 days (more than on in a family). For more details go to our Courses page and to book please go to the Contact page. From the Iffley Rd, take Daubeny Rd, turn right into Warwick Rd, take first left into Bedford St and follow down to the end of the road and straight into the school car park. Our entrance is through the first blue double doors on the left. We are now fully booked for both weeks over Easter holiday. Very many apologies to those who didn't get a place this time. Please do let me know if you would like to be added to our mailing list for future classes. HALF TERM from Tuesday 30th May to 2nd June 2017. SUMMER CLASSES from Tuesday 25th July to 18th August 2017. Possibly to 25th August but will confirm soon. For fairness BOOKING will open from 1st MAY for HALF TERM CLASSES and 5th JUNE for SUMMER CLASSES. But feel free to make enquiries anytime ! EASTER CLASSES OPEN FOR BOOKING ! We are already receiving enquiries for the Easter classes so officially here are the dates ! Tuesday 11th to FRIDAY 21st April 2017. Please look on our Courses page or further details on prices, venue and content of the classes 😁. We look forward to hearing from you ! Apologies for the silence ! We are back on track and ready to get started for an exciting new term. This terms emails have been sent and all classes are now full. Our classes start again from this weekend, Its a busy term with our older students preparing for GCSE, A level and Art Foundation. With Half term feeling ridiculously close we are now taking bookings. Holiday classes run from Tuesday 14th - 17th February 2017. HURRAH WE ARE NOW BOOKING FOR OCTOBER HALF TERM CLASSES ! From Tuesday 25th - 28th October 2016. You can pick and choose your days. Please get in touch via our Contact page for bookings and more information and directions. For prices and details of what to expect in an ArtWorks class please go to our Courses page. Sadly we are all booked up for the summer now, very many apologies for any disappointment caused. Please do send a note of interest through the contact form if you would like to be added to our mailing list for future holiday or regular classes. SUMMER CLASS BOOKING IS NOW OPEN ! 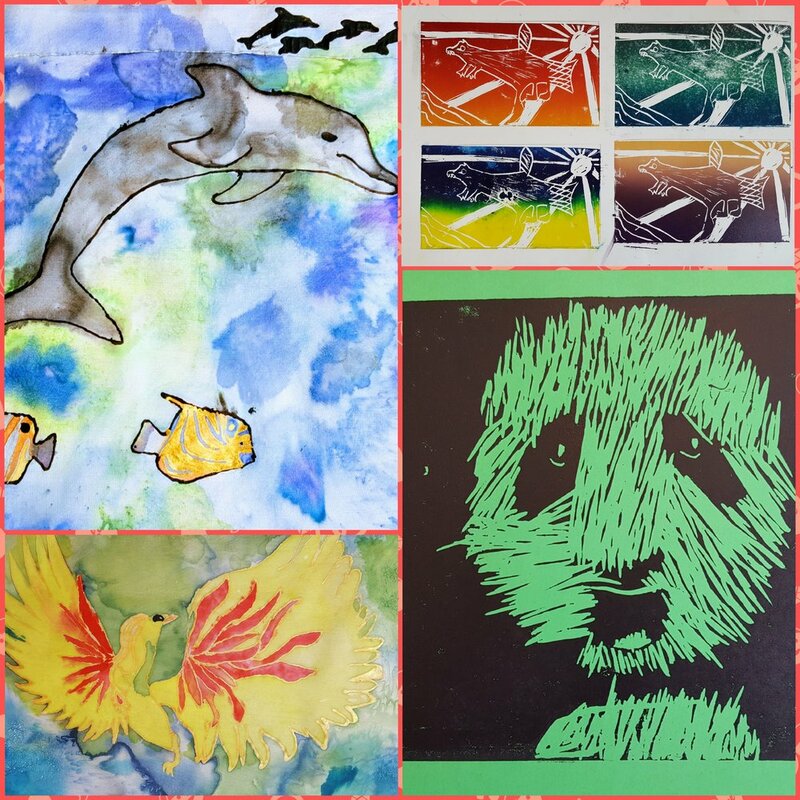 ArtWorks will be running holiday classes from Monday 25th July to 19th August 2016. As always you can pick and choose your days (details on our Courses page). Please feel free to book or make enquiries via our Contact page. ARTWEEKS SHOW A BIG HIT ! After a wonderful week and and a fantastic Private View on Tuesday, come and see the Show TODAY last public open day during the City wide Artweeks ! You know you want to ! !